I’ve always had a thing for Pink Flamingos. 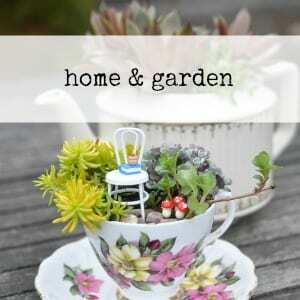 It seemed the perfect whimsical theme for a fun, end of summer dinner party! 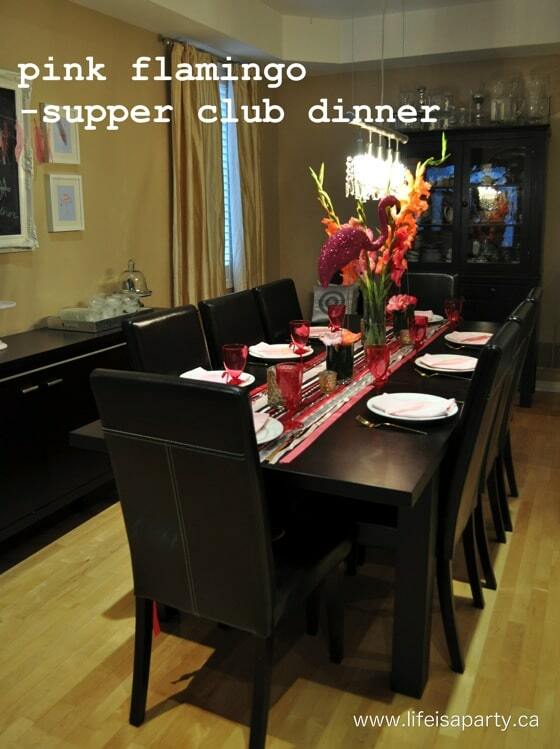 We are a part of a super club, you might remember me sharing our last “fiesta night” at our friends house, and this time it was our turn to host. We started off the night with a signature cocktail, which I named “the strawberry flamingo”, which consisted of a half and half mix of cranberry strawberry juice, and ginger ale with a shot of vodka, and a garnish of fresh strawberries. They were a sweet start to the evening. 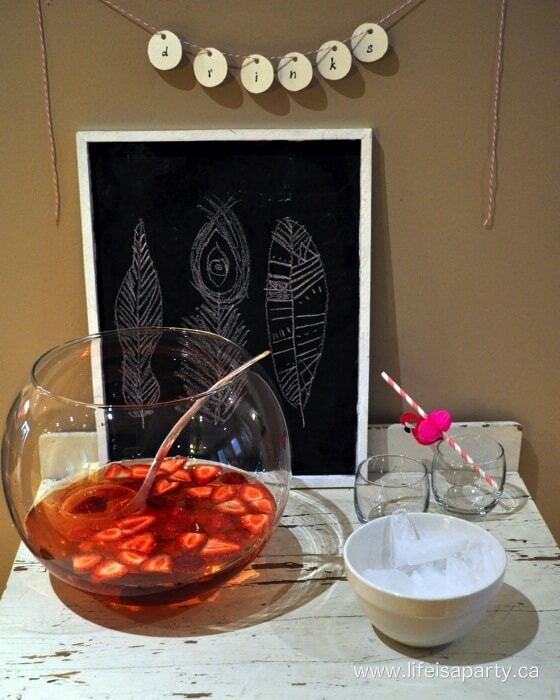 I love setting up a little drink station, and my daughter did the fun feather art with pink chalk to go with our theme. I picked up the flamingo straws at the Dollar Store, and just swapped out the plastic straws for pretty striped paper ones. 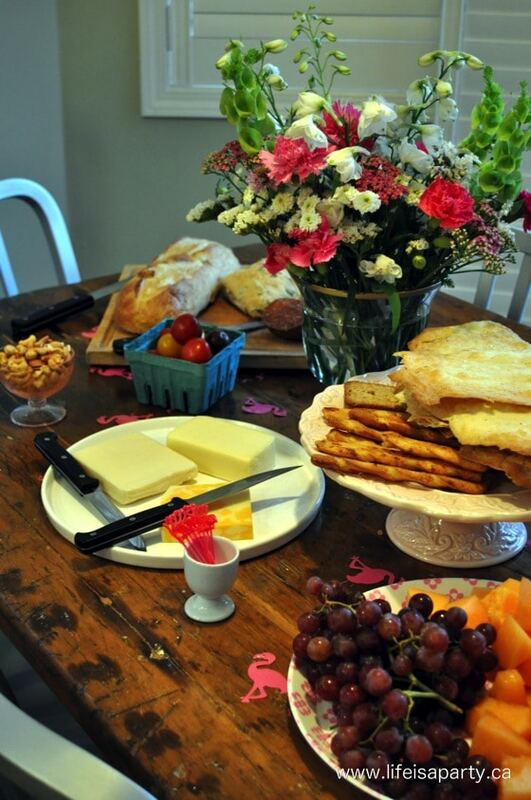 We set up h’orderves in the kitchen, and asked guests to help themselves, while we finished cooking the main course. I made a batch of my easy homemade crackers, which I have to say, never fail to impress. We also picked up some nice bread. At the farmer’s market I found some lovely cured meat, in spicy and hot. We served this along with some nice cheese, chutney, cashews, cherry tomatoes, grapes and a fresh, sweet melon, also from the farmer’s market. This is one of my favourite ways to eat, and it felt casual and summery. 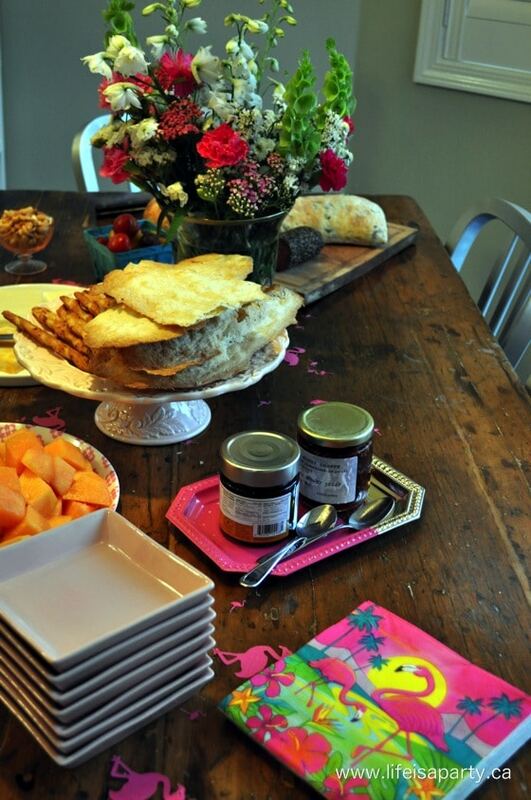 I wanted to incorporate some fun flamingos, so I used some flamingo confetti on the table, flamingo toothpicks for the melon, and some funny flamingo napkins. One of my fav. little details from the party was this sweet little flamingo jug. I found him at a nearby antique mall, and couldn’t resist bringing him home. 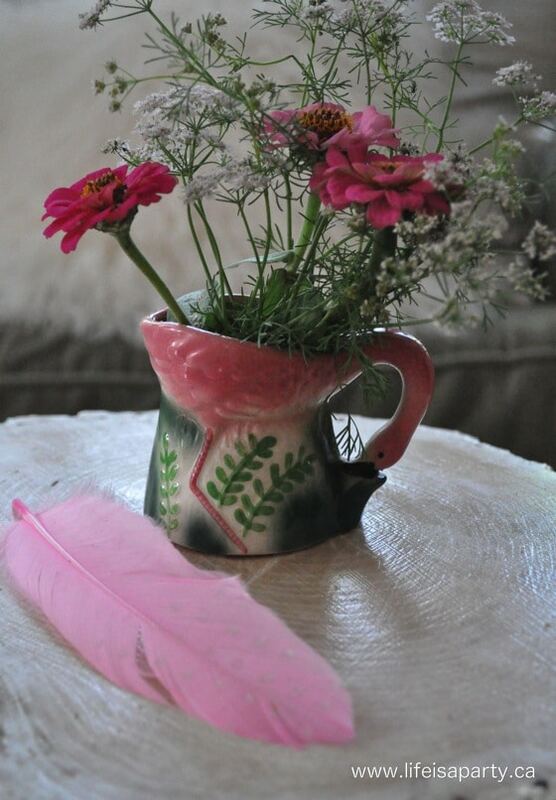 I filled him with a few pink zinnias and coriander flowers from the garden. 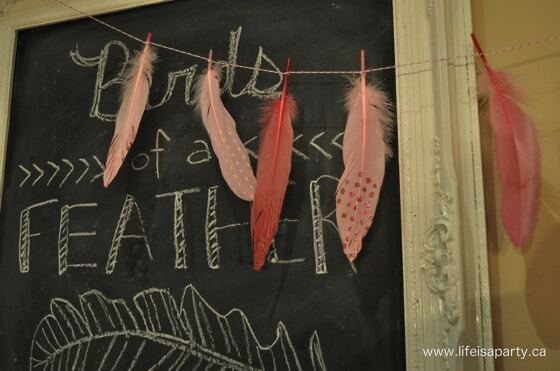 Love the pink feather too. 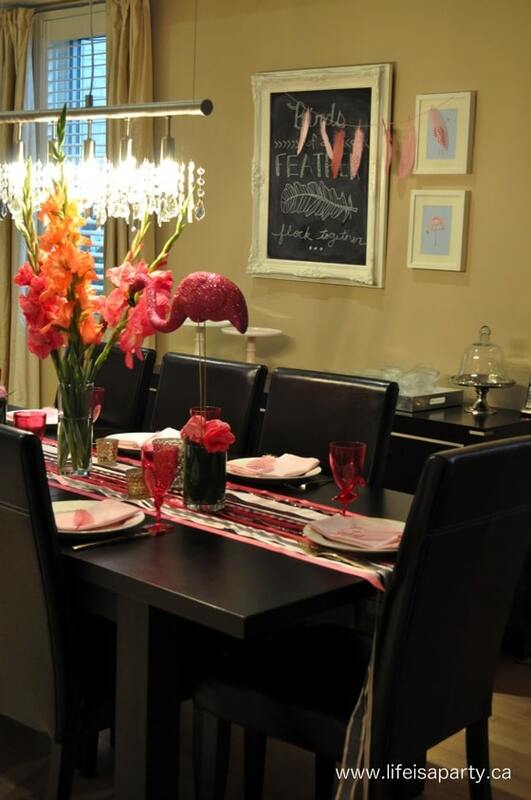 In the dining room, I used more pink feathers. 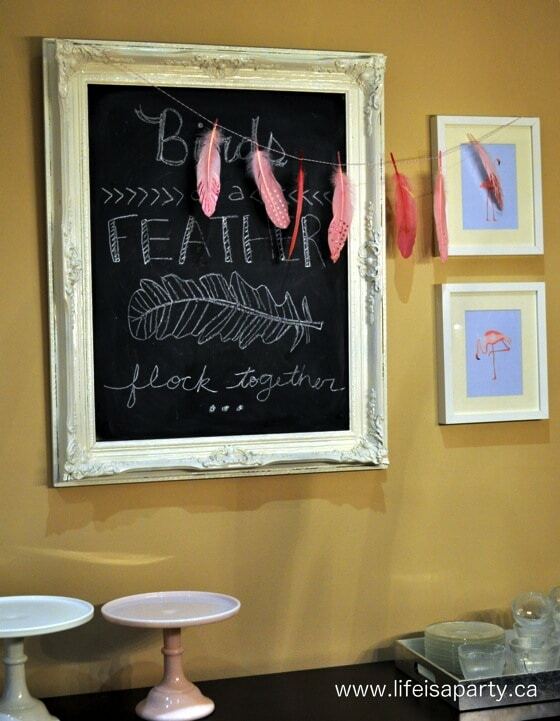 On the chalk board “Birds of a feather flock together”, seemed like a fitting saying. 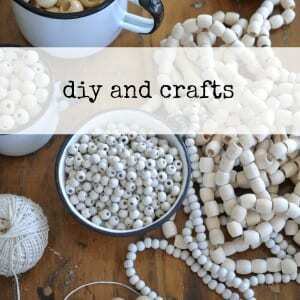 I picked up the feathers at the craft store and made the simple garland. 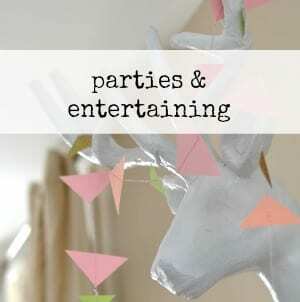 I also used these fun free printables, to add a little flamingo art. 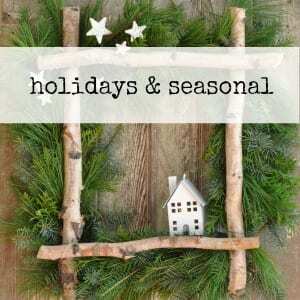 It was all inexpensive, and turned out so cute. 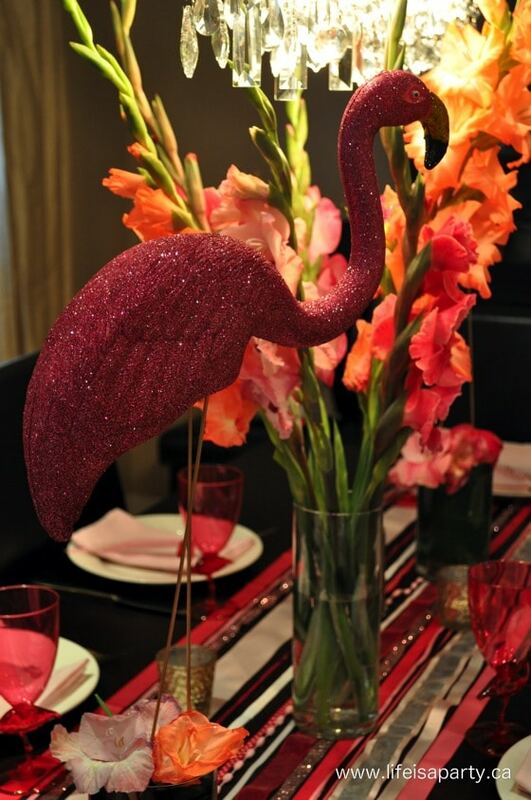 For the dining room table, I started with fun glittered pink flamingos, found at the dollar store. I spray painted their legs gold, and inserted them into a vase filled with floral foam, and lined with host leaves -which worked great to hold my little friends in place. I found the fun gladiolus flowers at the farmers market, and thought they were the perfect accompaniment to my flamingo friends -and they had every shade of pink to choose from. 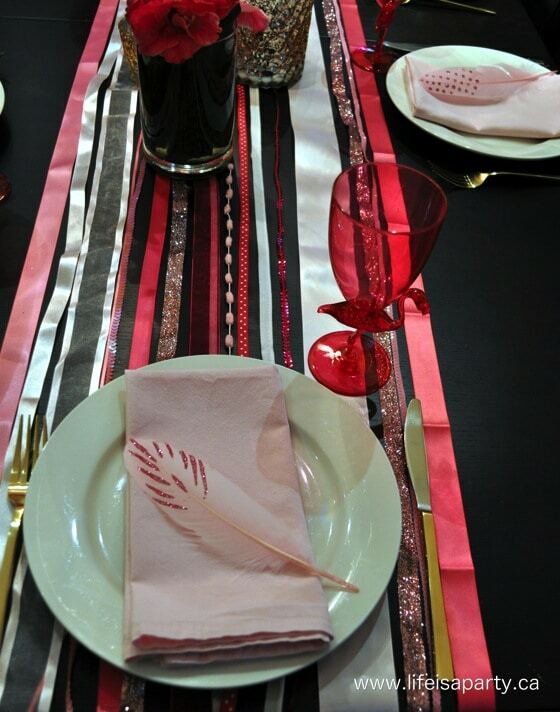 On the table I made a fun and easy runner out of different pink ribbon, just laid out across the table. Everyone also had their own flamingo wine glass, picked up at the party store, and sent home as fun little favour at the end of the evening. For dinner we served a big salad with roasted potatoes and green beans -a real favourite of ours. 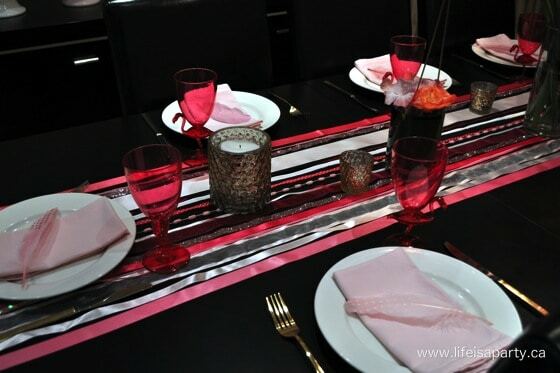 We also served a bit of a mixed grill, with marinated flattened chicken cooked and low and slow on the bbq, marinated flank steak, and butter garlic shrimp skewers -how could you have a flamingo inspired evening without some shrimp, right? After dinner, it was time for a light, and summery desert. 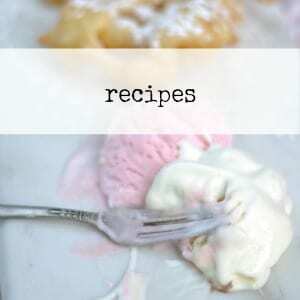 I made Pavlova with whip cream and summer berries, and just for tonight, made it pink to match. 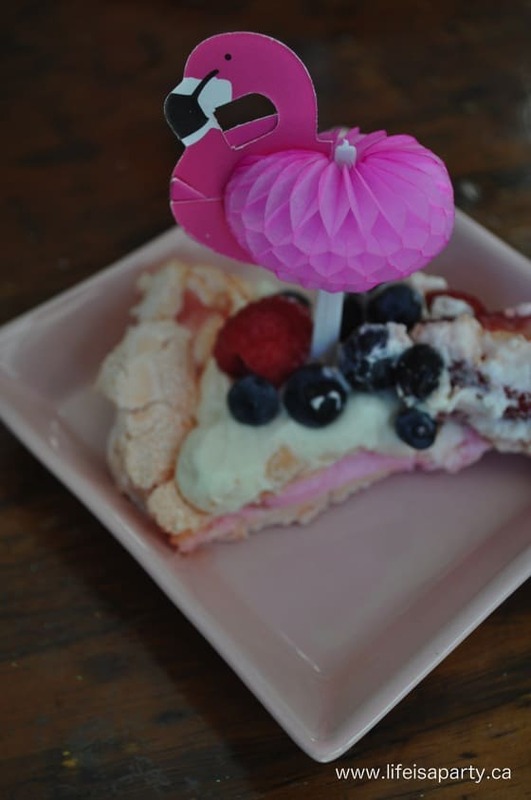 We had such a fun time, with our whimsical and fun flamingo supper club night, the perfect way to celebrate the end of summer together. With pink flamingos peeking out everywhere, life really is a party!